It’s two week into the new year of 2016, and I’m seeing everywhere things about New Year’s Resolutions. Blog posts, status updates, articles and mentions on television. It’s the popular topic of this time of year, what’s on everyone’s mind: what am I going to make of this new year? I’ve mentioned before my slight issues with resolutions. But don’t get me wrong – I think resolutions are great. It’s a great practice to set goals for yourself, to hold yourself to a new standard as the new year comes around. But just as much as there are mentions of what resolutions people should endeavor to adopt, there are just as many on the little use of resolutions at all. I myself have always set New Year’s Resolutions, ever since I learned what they are. I thought it was a cool way to set goals and plan for the new year. But, like many people, I never usually got around to fulfilling the majority of those resolutions. And then the next year, I would oftentimes have the same resolutions as a kind of rollover system. They were things that I wanted to get done and become habit, so I would continue putting them on the list until that happened. Being in an eternal cycle of not fulfilling resolutions and just putting them on the list again for the following year serves nothing except an increase in self disappointment. And being disappointed in yourself makes you not want to try again – you’ve violated your own trust. Maybe the problem lies not in the resolution itself, but in the reason why you never fulfilled that resolution in the first place. If your resolution is to go to the gym more, think about why you never when in the first place. Were you lazy? Procrastinating? Scared of the judgement of everyone else there? I’ve found that more likely than not, the reason people don’t do things or procrastinate on them is because of some sort of fear. Fear of pain, of judgement, of conflict, of failure. Fear tends to be our biggest motivator in not doing something, or putting it off. Fear is a paralytic – it definitely has been for me. Having resolutions is great – it’s great to have goals for yourself for the coming year. But those resolutions won’t happen, won’t be fulfilled, if the underlying fear is not faced and conquered. Fear is the real problem, the real deterrent, so confronting that fear is the first step to actually accomplishing your goals. 2016 is a new year, a year to make things happen. Maybe you have a list of resolutions, or a mantra, or a word to define the year. But also make this a year in which you conquer your fear, whatever that may be. It is the year of courage, it is time to be brave. And being brave in the face of the fear that has held you back so many times before is how to best live and own the new year. “New Year, New You” only works if you have the courage to fully pursue it. I was shopping one time with a friend about four years ago, just looking at some clothes. He showed me this one shirt, and I took one look at it and dismissed it. “Why not?” He asked. “I can’t pull off button-downs” I said. I never felt like I knew how to wear them without looking like I was wearing some kind of costume. “Sure you can,” he assured me. He convinced me to buy it, although I was pretty sure it would go untouched in the back of my closet. But every once in a while I would pull it out and wear it for the day; why not pretend to be a button-down-wearing kind of girl for a day? Now, I own several button-down shirts, and I really love how they look. Turns out, the way to pull something off is just to wear it. If you want to pull off a button-down shirt, then wear the button-down shirt. In the same way, I’ve never considered myself much of a risk-taker. I’ve always been an admitted coward, someone who skirts away from anything scary or difficult, someone with a perpetual flight response. I avoid conflict like the plague, and am not the kind to spontaneously tube down a creek or hike a mile straight up a mountain. I certainly never considered myself to be the kind of person who could up and backpack for three months on my own. I had always admired those ‘types’. You know the ones: those adventurous people who keep up with world affairs and have an opinion on everything, who just decide to backpack on their own and go with confidence and make things happen. I always saw those types of people and thought I wanted to be like that; I wanted to be someone who could travel the world, who could think deeply about where I am and where I come from, who could go confidently in the direction of my dreams. But I couldn’t, obviously – I was a coward, I was a weak person who couldn’t handle difficult situations or do anything on my own, who just took the easy route. That was just who I was, and I couldn’t change anything about it. I just had to be content with that. 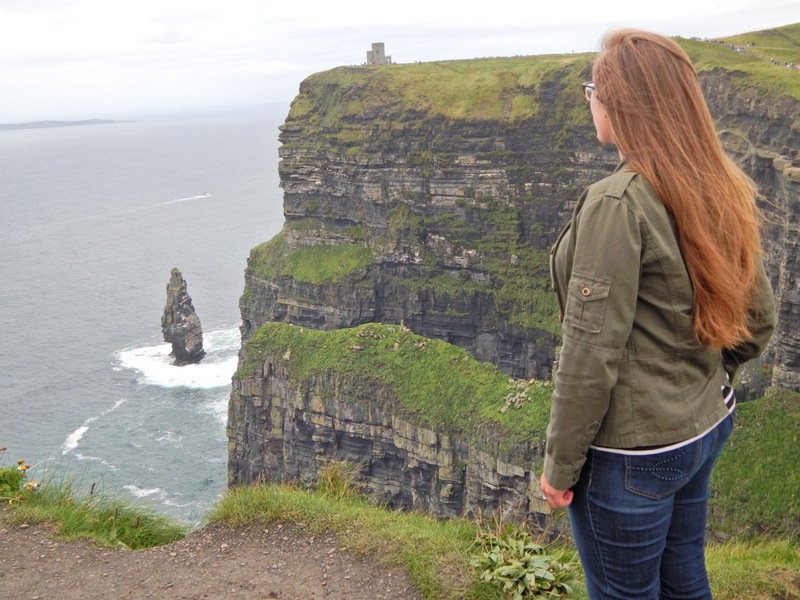 Then I decided to study abroad, which was the biggest decision I had ever made for myself. It was my one big risk, my attempt at being like that person I wanted to be. And it actually went well – I was more capable than I ever expected. I was actually able to travel and be independent and survive outside the direct protection of my parents. I was kind of amazed with myself, not really expecting it to go so well. So I decided to try it again. I decided to study abroad again, in Peru, with a program that was way more suited to the ‘type’ I so admired. I nearly wimped out of it, not considering myself qualified or suited for it, but still ended up getting on that plane. And again, it went really well. I actually was able to live with local Peruvians, to trek through the Amazon, to conduct independent research. I didn’t spontaneously combust for upsetting the natural order or the status quo for ‘people like me’. I could do it, and do it well, although I still felt like the outlier among my much cooler and more qualified peers. I never felt like I had become that person I wanted to be, but rather had just adopted the behavior like some kind of imposter, like I was just wearing that shirt for a day. I wasn’t the adventuring, risk-taking type – I was just pretending. Soon enough everyone would realize that I had fooled them all. But now, as I approach the end of my three month journey of independent travel, I’ve come to realize that I am that person. I am that person I wanted to be: the traveler, the person who cares about world issues and tries to think deeply about who and where I am. Turns out, the only thing that was keeping me from being the person I wanted to be was myself. I always had the ability, and I definitely had the desire, so all I had to do was act on it. If there is one thing I’ve learned on this trip, it’s that nothing really holds us back but ourselves. There are no rules that dictate how we live our lives or how we fit into society – we decide all of that on our own. And if we find ourselves stuck in who we think we are supposed to be or should be, we have the power to change it for ourselves. If you want to be better at something or start a new habit, then practice and make small steps to make that a reality. If you want to be a different kind of person, then act on it – start making moves, however small, to actually become that person. You don’t have to wait for permission, and you sure as hell shouldn’t resign yourself to being stuck as you are. The only thing really keeping you from becoming who you want to be is action and mindset. Even faking it until you make it is a good step – it definitely worked for me. It’s as easy as throwing on a button-down shirt a few times until you find that it suits you after all. So what are you waiting for? While I was in Belgium, I decided to visit the small town of Ghent. I had been told that it was like Bruges, just as cute and small and medieval, but less touristy than Bruges (and perhaps slightly more authentic). I met up with my friend Jenna, whom I met while I was in Bruges the day before. The plan was to meet up with her in Ghent, since that’s where she was staying and I was commuting from Brussels. We would meet in the late morning and go about town a bit, visiting the sights, before I headed back to Brussels. What actually happened was a smidge different. I ended up missing my stop in Ghent, like a noob, so I had to get off at the next stop in the middle of nowhere in the rain for thirty minutes to catch the train going the opposite direction. I eventually made it to Ghent, but significantly later than planned. Luckily, Jenna is the chillest person ever and just went with it. From there it was great. We did just kind of wander the streets for a bit, talking a lot and generally having a good time. We didn’t have much method to our madness, but it ended up being really fun: randomly visiting the public library with a weird sculpture at the front and going down one or two wrong streets. Ghent isn’t that big, so it was never much of a problem – it was more of a journey thing than a destination thing, anyway. Ghent is a funny place in that it has literally 5 churches in a row on the same street. Why this is, I have no idea, but it made visiting them a lot easier. And these weren’t some baby churches or small chapels, either – they were all he massive cathedral-sequel churches that Europe is known for. Each and every one was beautiful, and different in its own way. Then, of course, the streets were as charming as promised, the same charming Dutch architecture and canals and bikes everywhere. 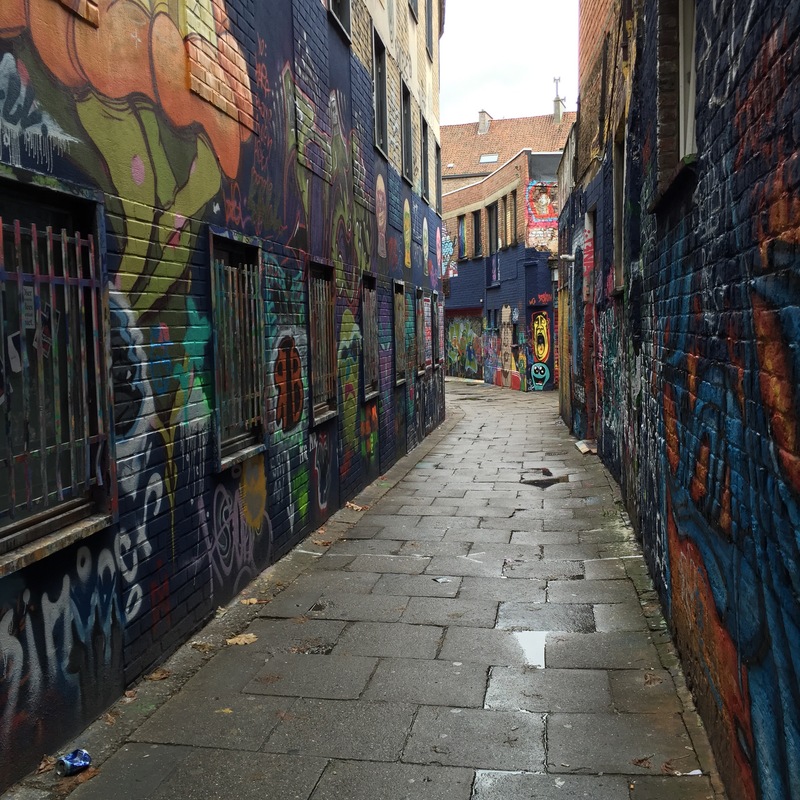 There was also a whole alley that was completely covered in street art, top to bottom. It was a full block long, and every wall, window frame, and railing was painted. Some of it was the tagging we are used to, and other parts were full-on works of art; it was a really cool place to visit. After paying a visit to the local castle, we decided to call it a day. It was already late afternoon, and rainy, and I had a train to catch. So we decided to catch a team that went back to the train station. Again, that was the plan. At first we took the wrong tram. We realized after a few stops that we definitely weren’t going in the right direction, so we got off. Then we got on another. But then it didn’t seem to be going in right direction, either. We decided to wait it out – after all, it was technically going in the general direction of the train station. And it did for a while. But then it kept going further and further away, so we decided to just walk it. Ghent’s a small town, so it wouldn’t be a big deal. It turns out there was no direct way to get to the train station from where we were, so we had to actually go around and along the main highway. It was drizzling, not raining enough to warrant an umbrella, but enough to make it slightly uncomfortable after a while. By the time we made it to the station, we were petty tired of walking and ready to just sit for a long bit. But the whole time, we couldn’t help but laugh. Something about the ridiculousness of it all made the whole thing better, because it seemed like as soon as we tried to make things better, it would turn out to be yet another wrong choice. But it just made it an experience to remember. Things aren’t funny or memorable when everything goes to plan – without that, my day in Ghent would have been pretty unremarkable. But now I can look back on it fondly, can smile and know that I was really living then. That was pure life, the silly, stupid mistakes and stupid public transportation and early season rain. It was the stuff memories are made of, and I wouldn’t have had it any other way. That being said, as soon as we got to the train station, our tram was sitting right out front, taunting us. While we couldn’t stop laughing for the next few minutes, I will tell you to never trust tram 4 in Ghent. The third country in my 3-month journey across Europe was lovely little Belgium. I got there by taking a train through the Chunnel, which was actually surprisingly easy – it sounds way fancier than it actually is. I started in the capital of Brussels, home of the EU and Delicious Fried Things (I’m pretty sure that’s the technical term for it). 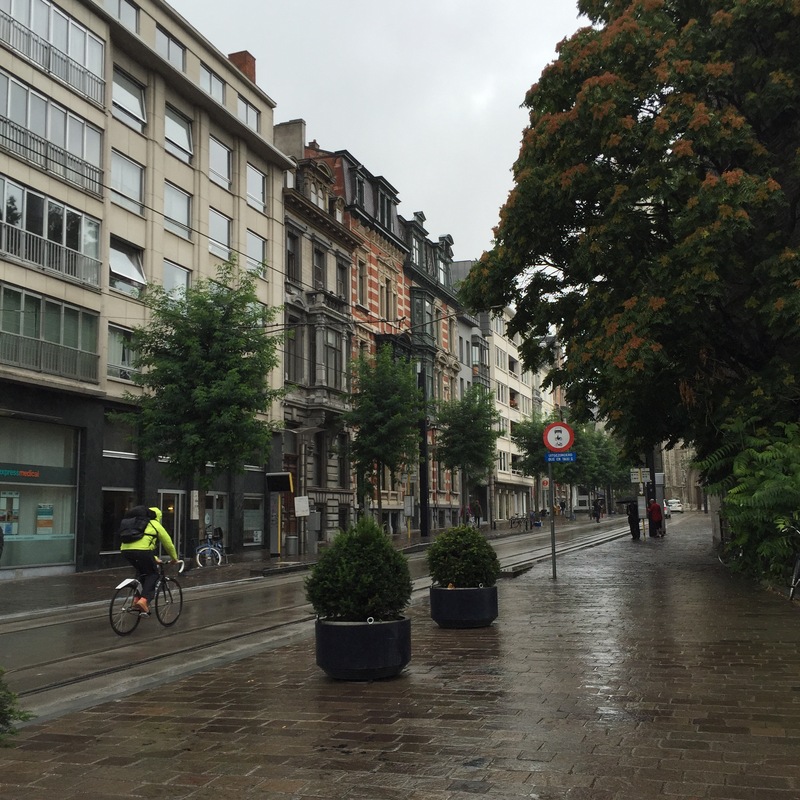 Brussels has a beautiful main center, with large, imposing buildings on either side. I was in Brussels before about 5 years ago, and that was the majority of what I remembered about it – I remembered it being a boring place redeemed only by their amazing beer, fries, waffles, and chocolate. 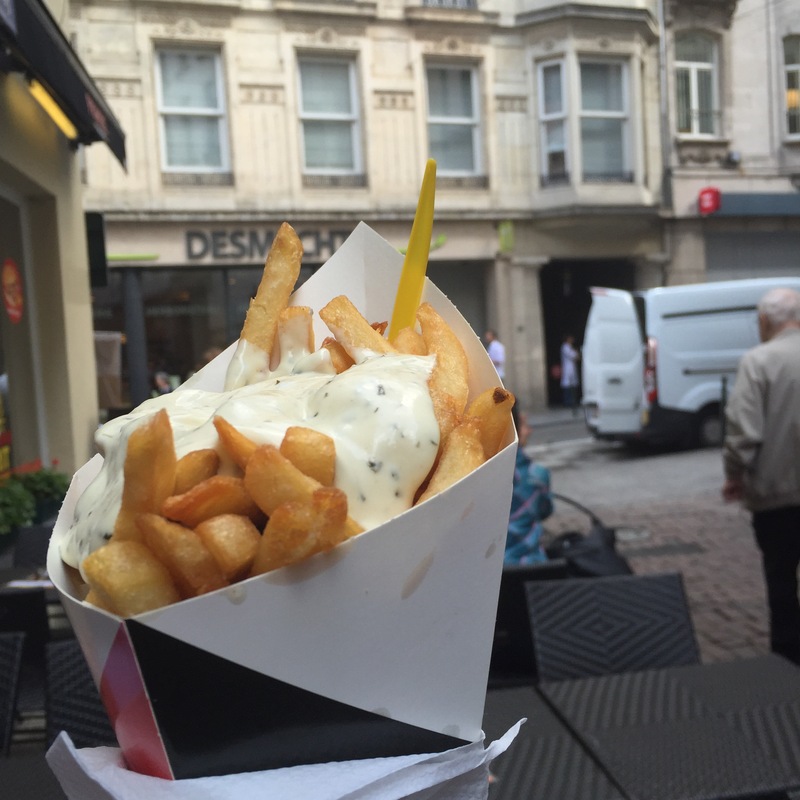 This time around, I wanted to do Brussels justice, and I was definitely pleasantly surprised. This place is really only boring if you don’t try to see the cool places all around (yet another reason to always take advantage of free walking tours). Learning the extremely complicated history of the place was really interesting, and made a lot of things make sense. The church is reminiscent of Notre Dame and really pretty inside, definitely not a sight to be overlooked or dismissed. And Delirium is a bar complex famous for having over 3000 different kinds of Belgian beer. There is so much more to the place than others think, but it doesn’t feel like a big capital city; it has the cool atmosphere of a chill town, a place where people just live instead of trying to impress tourists all the time. Belgium is also known for its beautiful small towns outside the capital, and I got to visit two. 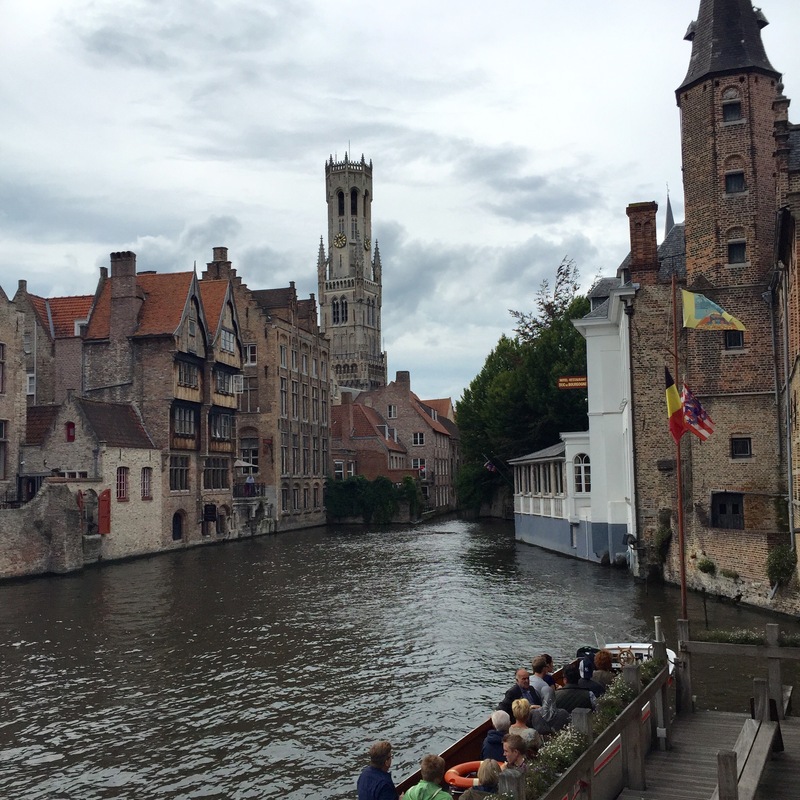 The first I visited was Bruges, a place famous for its beauty and charm, having even gotten its own movie. Its reputation is definitely well-earned, because I was also sucked into the simple charm of the place. 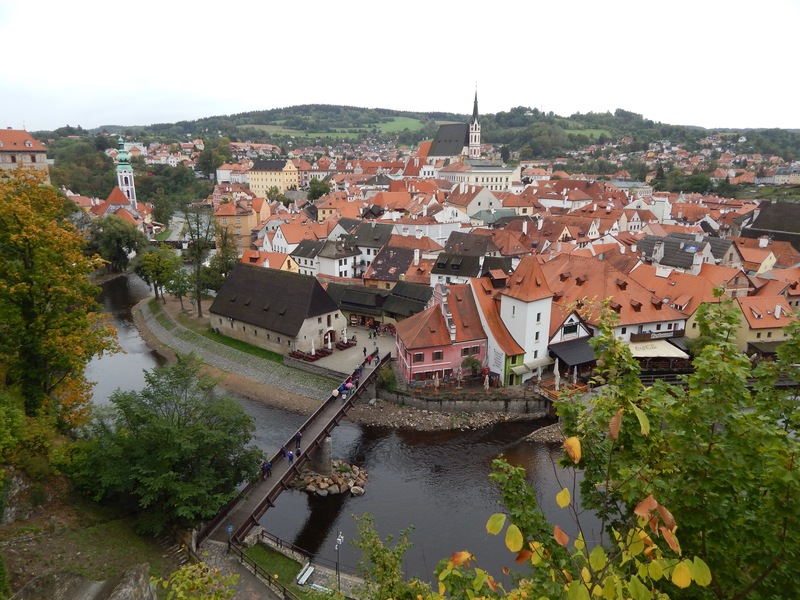 Part of the charm is its canals and old buildings: it really is the image of a stereotypical medieval European town. We went to a small bar hidden away from one of the main streets called De Garre, where the house beer of the same name is 11% alcohol, and then had perfect Belgian waffles fresh off the food truck. We also crossed over the Death Bridge, a bridge made from the old tombstones of the cemetery, and had an overall good time. I also went to the small town of Ghent with a friend I met in Bruges, which was just as charming but without the amount of tourists (or crazed Brits there for a football match). Belgium was such a nice place, and a change from Scotland. It was smaller, chiller, and just a good place to wander and witness history. While Belgium can have a dodgy past, it also isn’t afraid to acknowledge its shortcomings; a quality I have found a good amount of in Europe, and one I find refreshing as an American. It was a great leg to my journey, although I may have consumed more carbohydrates than is normally recommended. Great atmosphere, great food, great country. Wow, it is so weird that I’m two months into my trip with just less than a month before I’m back in the States. I feel like I’ve done so much, seen so much, and yet not nearly enough. I guess the more you see a place, the more you realize there is to see. Learn the language: Knowing key words and phrases can help you a lot when getting around. Just basic things like ‘hello’, ‘thank you’ and ‘goodbye’ can really help you to feel a bit more immersed in your surroundings (not to mention the locals are more likely to be nice to you). And it’s really important for other matters; like in my case, if you have food allergies, learn the name of that thing in the language so you can always ask. It will save a lot of trouble and stress (and perhaps medical bills), so take the five or so minutes to memorize them and you’ll be golden. Get out of the city: Nature is where it’s at. I can definitely say that a lot of my favorite memories are going to be from when I got out of the city and took in the sights of the countryside. After going from city to city, they can all blur together – a lot of what makes a country unique comes from its natural features, and nature is just really neat, so it’s good to just get out and have a nice dose of the outdoors. Don’t use wifi just because it’s there: Wifi is everywhere in Europe, which in itself isn’t a bad thing. But there are some times when it would be better to just wander around or have lunch to yourself without the Internet as your date. Just because free wifi is there doesnt mean you have to – or should – use it. Traveling is exhausting: It’s true. Ask anyone, and if someone says to the contrary, they are lying. With all the trains, staying in hostels with 10 other people, and making the same small talk every day, it can be tiring – not to mention all the tourist isn’t and navigating foreign cities. So take a break and allow yourself to rest, whatever that looks like to you. Find a park, hang out in a museum, or if you’re like me, go to a cafe and have a nice cup of tea. You may have limited time, but there’s no use in traveling if you’re too exhausted to enjoy it. Go vegetarian: One thing I’ve loved doing is trying the local food – it’s always delicious. But it also is probably not the best thing to eat day in and day out. My diet the last month or so has consisted of a lot of meat, potatoes, and bread. And cheese. As much as I like love those things, they’re not very good at sustaining my body. Luckily, there are increasingly more vegetarian and vegan places sprouting up all over Europe, and they are a great way to get some actual nutritional value into your diet as your travel. They can be cheap, delicious, and make a serious difference on your energy levels for the whole day. These are only a few practical lessons I’ve learned over the next two months, along with many, many more. Here’s hoping I can continue learning during my last month, and maybe put some of these into practice at home. When I was first telling people about my plans to travel Europe by myself for three months, I got a whole bunch of reactions. ‘Wow, that’s amazing!’ ‘Aren’t you scared?’ ‘How do your parents feel about that?’ ‘How will you pay for that?’, and the list goes on. But perhaps my favorite response came to me as I was talking to a stranger at work. In response to my trip, he asked me ‘What are you looking for on this trip?’ It took me by surprise, as I hadn’t even thought of that before – what am I looking for? What does that even mean? I said something along the lines that I’m not necessarily looking for anything, that I’m just going with the flow and experiencing life in the world. But I’ve realized that not having an answer to that question means that I have been devaluing what this trip could potentially mean. Saying that I’m not looking for anything means that I have no real intention behind what I’m doing, that I’m not thinking deeply or seriously about my trip. Having thought about it more, I realize I am looking for something. As cliche as it may sound, I am looking for myself – a purer version of myself, away from the influences of home. I am looking for adventure and spontaneity that can’t be found in a Colorado suburb. I’m looking for the freedom and permission to be wild and without inhibitions, to follow that which I feel I should do and not what I’m told I should do. I’m looking for an understanding of the world that doesn’t come from books or movies or TV, but can only come from experiencing each place I visit. One thing I’ve learned on this trip is that it’s important to have some idea of what I want before I visit a place, to think about it and have an idea of what I want to get out of it. I’ve visited places because I’ve heard cool things about them and heard they were pretty, but then when I arrived I realized I had no idea what to do with myself there. I hadn’t gone there with any intention, and wasted time just going with it. There are some cities that I wish I had looked into and thought about more before I went there, because I would have gotten a lot more out of them that way. There’s a certain romanticism that goes along with going with the wind, and I have definitely enjoyed that on my trip so far. But this isn’t about travel; this isn’t about not having anything to do in a small town in Poland or Germany. In any area of life, it’s important to pursue something with some kind of intention, to think about what you are looking for in doing that thing. Otherwise you’ll get there and realize that you have no idea where to begin. It really is important to think about these things ahead of time, to consider your direction with intention. It’s much harder to get anything out of something when you don’t know what you’re looking for. Going forward, with just less than a month to go, I’m going to try to put this into practice. I’m going to research where I’m going, but more than that, I’m going to seriously consider my next steps. Whether it be grad school, getting a job, or any other direction, it’s time to really think and ask myself the question ‘What are you looking for in doing this?’ And if that can’t be answered, maybe it’ll be time to reconsider a path that will actually lead to a place worth going. 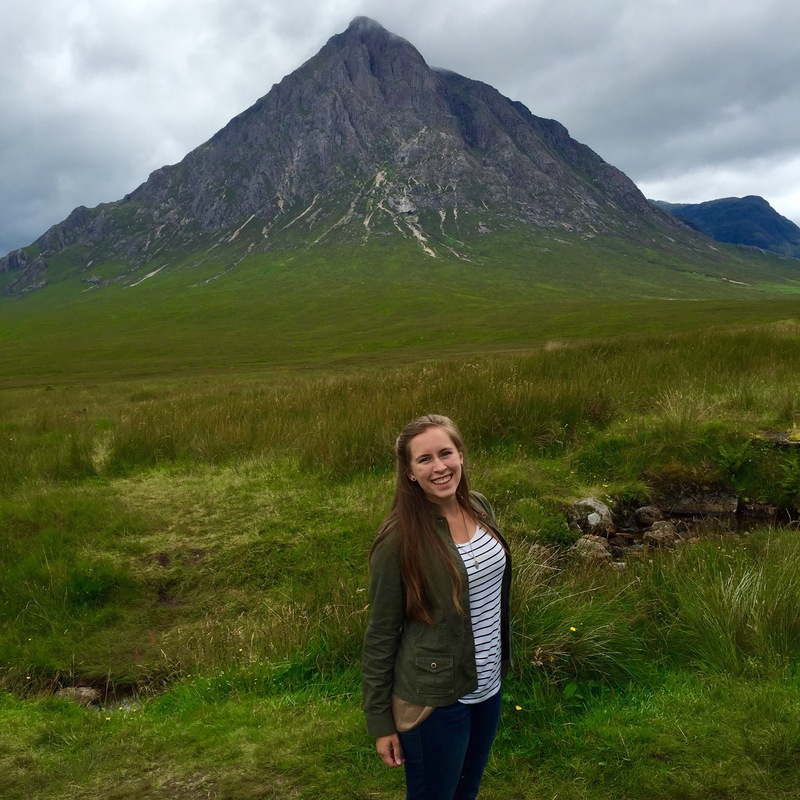 Whenever I look back on my time in Scotland, it will most likely be a memory of my time in the highlands. I think most people know of the Scottish highlands, of the beautiful stretches of green that decorate the north of the UK. And being a Colorado girl, I had to take in my look of the mountains where I could get it. We stopped in several glens, but more specifically in Glencoe and Glenfinnan. Glencoe is a place of a lot of history – it’s the site of the famous violence on the MacDonalds by the Campbells, a conflict still holding weight to this day. The glen itself is the most marvelous thing, with rolling hills and mountains and streams. It made me feel like Princess Merida a bit to be going through the glen, without a care in the world besides enjoying where I was and feeling completely free. Something about getting out of the city and exploring the countryside really helps put things in perspective, and it was much needed. 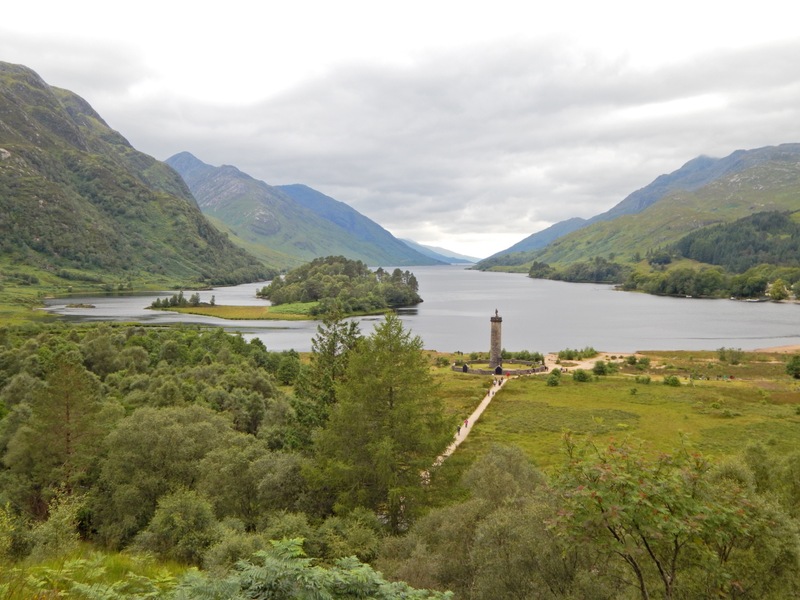 Glenfinnan is a glen surrounding a loch, and the view was stunning. There were mountains on either side, and a tower monument in the middle standing guard. No words or pictures could really do the place justice, and I just stood on that hill for a long while taking it in. Also from that spot I saw it: the Jacobite Steam Train. 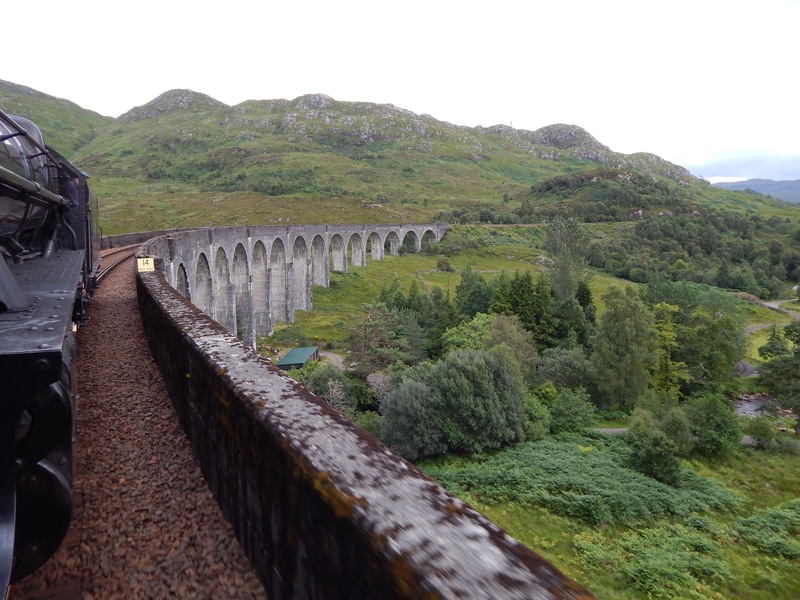 For those of you who don’t know, the Jacobite Steam Train travels through the highlands, and more specifically over a viaduct in Glenfinnan. The exact same viaduct and train track from the second Harry Potter movie, the viaduct that the Hogwarts Express travels over. Yes, I chose this tour on purpose. After Glenfinnan, we made our way to Mallaig, a small port town from where the Jacobite Steam Train starts and stops. A quick fish and chips later, I’m on the Hogwarts Express, watching the highlands pass by in all of their incomparable glory. And then there I was – I was on the viaduct. I was going to Hogwarts. (Needless to say, I was fangirling incredibly hard at this point). After we passed it, I felt like I could die happy. But even after that there were more beautiful views of different glens and lochs, and I wished it would never end.